It is a great privilege working at MAPS College as a fulltime lecturer. The trust, working environment and the broader flexibilities given by the management have enabled me to come up with the best output each semester. MAPS College took a great step in 2013 introducing Bachelor’s degree and launching CTH in both regular and block mode a year ago to cater to the biggest industry in Maldives. In fact, MAPS College counts among the best of best in the Maldives. In addition, with the modern facilities, experienced lecturers and the learning atmosphere gives you an extra wing to complete your studies at MAPS College. Short and sweet, a Maldivian who wishes to continue for further studies locally, you can never chose a better college than MAPS. As MAPS College prepares to celebrate its 20th year of operations in 2019, we are delighted to announce our January 2019 intake is officially open for applications. Future students can now apply to join one of over 30 courses starting in the MAPS College January 2019 intake, listed below. 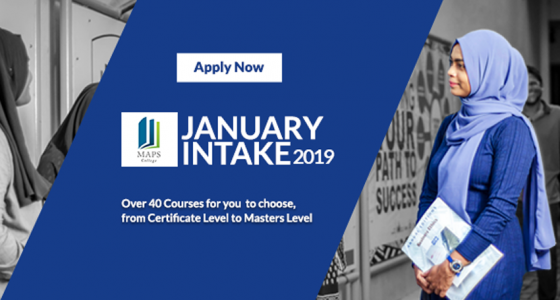 With a broad range of subjects, levels, local and international qualifications to choose from, January 2019 promises to be the one of the biggest ever intakes for MAPS College. 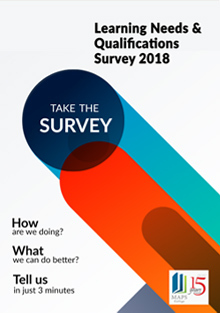 The deadline for applications is 31 December 2018. You can apply online or in-person at MAPS College as detailed below. Download and submit your application form to MAPS College reception, located at H. Vaifilaa-age, 1st Floor, Janavaree Magu, Male’. Before you apply, please check that you have read and fully understand the relevant information on Terms and Conditions for Studying at MAPS College. For more information and details of the course fees, please click the desired course or contact MAPS College on 331 4621 or at info@maps.edu.mv.